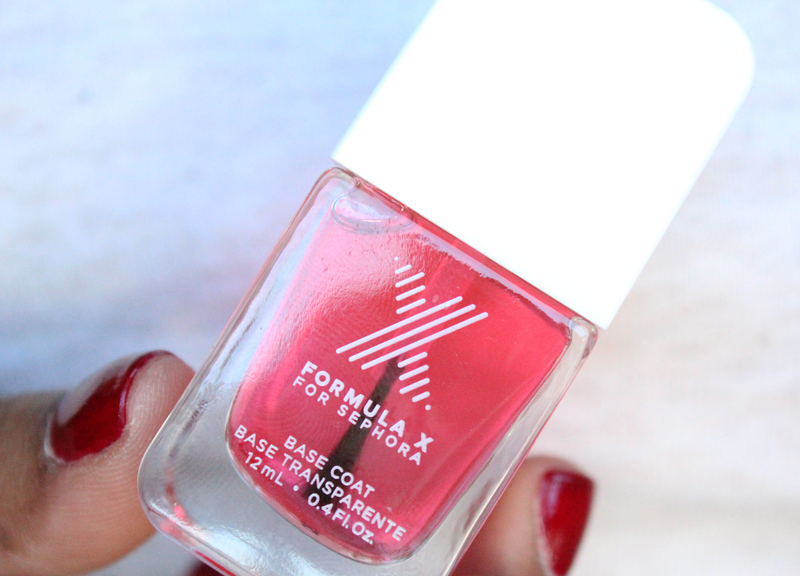 Review: Formula X for Sephora Sticky Base Coat – amandarobots. My Butter London base coat was on its last legs – it was getting hard to spread, and even polish thinner couldn’t save it. I had had quite a nice experience with Formula X’s “Curiosity” – it’s since become my go-to red. I was also interested in trying a sticky base coat, and Sephora’s is readily available to me, unlike Orly or CND. This shade, though beautiful, tends to chip within a day of wear – if I apply it on a Sunday, I’ll see chips by Monday afternoon. Over Formula X for Sephora’s Base Coat, the wear is astoundingly good. It’s Wednesday evening and all I’ve got is some minor tip wear and edge chips that aren’t noticeable at all. During application, it made the polish spread very evenly. I even tested it under Essie’s Blanc, which tends to lean super streaky, and it evened it right out. My guess is that the sticky layer gives the polish something to grip onto – that accounts for the long wear time and even application. It’s not cheap, but base coat tends to last a while – I’ll purchase one about once a year. If you’re in the market for a new base coat, this is definitely one to consider.